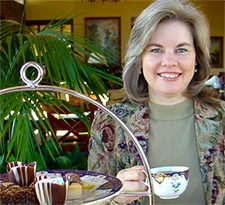 I am purposefully seeking ways to add a little more peace, joy and fun in my life; that's why I started this tea story. Currently I am searching for a new supplier for my tea. So I’m visiting websites and ordering different blends every month. I’ll be posting about my finds along with my visits to tea rooms. It’s always the perfect time for a cup of tea. Won’t you join me? I don’t care who you are; this is funny. And also, an appropriate use of the term, High Tea. Here’s a company I found online called High Tea that makes tea with phyto cannabinoid – derived from the leaves of the hemp plant contains omega-3 fatty acids, terpenes, vitamins and chlorophyll. They say it is suggested for relaxation and to provide a calm state of body and well-being. They have bottled iced tea and tea bags for sale on their website. I haven’t tried their tea nor do I know anything about it but it sure did make me laugh. I’ll give them a nod for having one of the best company names ever!